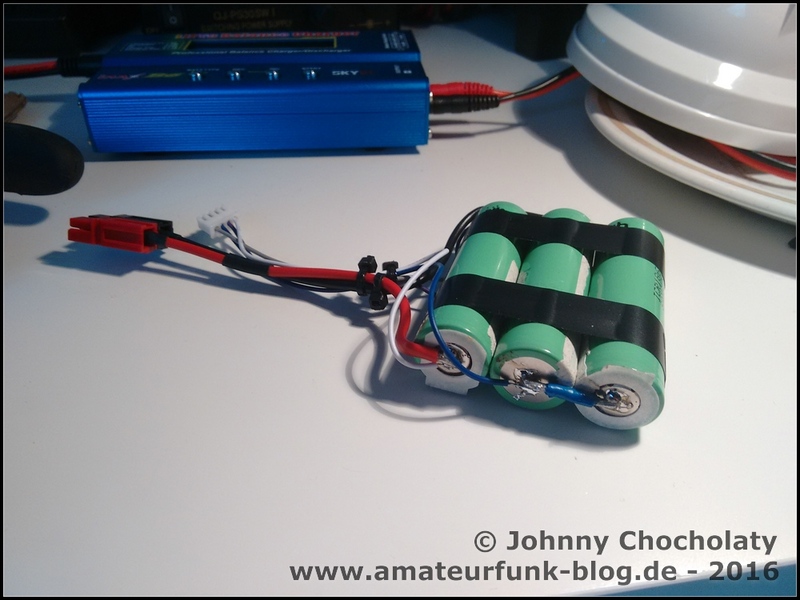 In this article I will describe how I built a cheap DIY 18650 Lithium-Ion battery pack for my Yaesu FT-817. After 65 SOTA-activations and other outdoor operations like IOTA, WWFF I had to reduce some addional weight of my „go-bag“. I already went from RG-58 coax to RG-174 and also scaled-down the diameter of the antenna wire, but this is a different story. 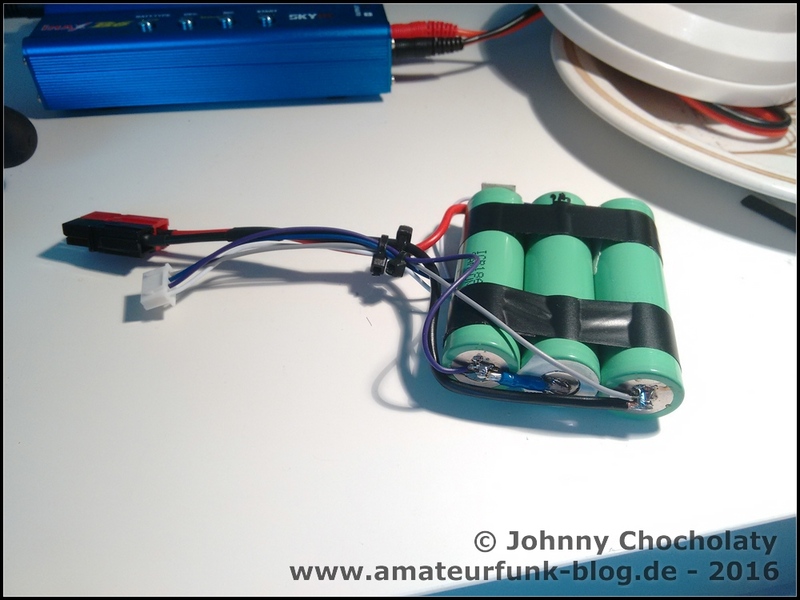 So I looked what is on the regular market and found a lot of people in the amateur radio scene who are using Li-Po (lithium polymer) packs. Those packs are usually made for RC purposes and in the first moment I thought that they perfectly matches all of my needs. They are cheap ($15 per 2500mAh pack) and a 3S pack (3 cells in series) gives 11.1V nominal output. This is perfect for my FT-817. When I watched some Youtube videos, I saw that a lot of people recommend a so called „Li-Po Safe“ or „Li-Po Safebag“ to avoid that a Li-Po pack will burn your house in case of something goes wrong. A little bit anxious I decided to ask someone who really has experience in this field. 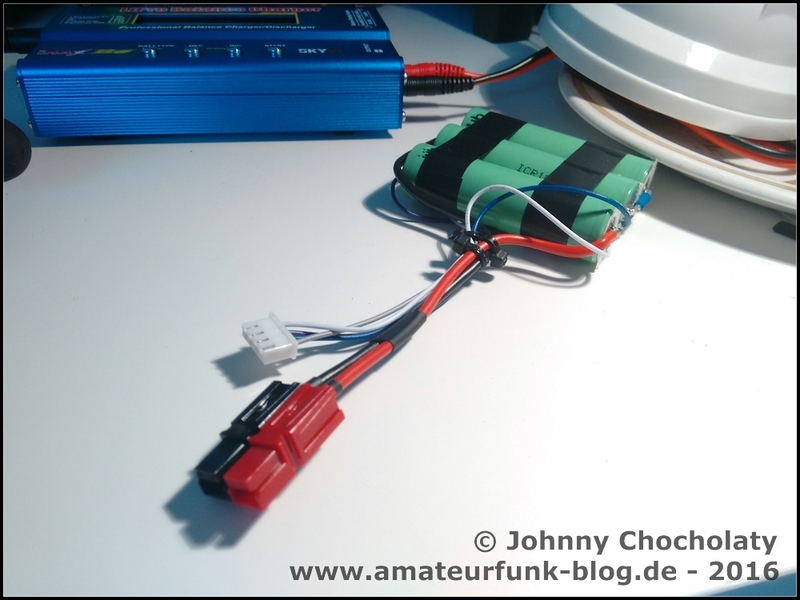 I remebered that my friend Michael, DB7MM - who is also the SOTA association manager for Germanys DM region – is a chemical scientist and also holds a PhD in this specific Li-Ion field, so I aked him some questions about the Li-Po packs. He confirmed that they can catch fire and that there is a certain risk in using RC Li-Po packs for amateur radio reasons. The cells are usually unprotected due to the ability to deliver 100 Ampere + for RC use. Also the so called "pouch-cells" can be pierced very easy, even with a pencil in your go-bag! If you pierce such a RC-Li-Po cell you have a good chance of a burning pack, resulting in an explosion. Not really an option for me then. So Michael told me, that the best way is not a Li-Po pack but a LiFePo4, which is his recommendation. The cell voltage of a LiFePo4 pack is not 3,7V like on the Li-Po pack, it is 3,3V nominal here. So that makes 13,2V on a 4S LiFePo4 pack which is in the specs of all standard ham radio transceivers and this is also the perfect voltage for my chinese MX-P50M amp. 11.1V of a 3S Li-Po is too low for a full output of 45W, 4S with 16,8V of a 4S Li-Po would be too high. The other advantage of the LiFePo4 over the Li-Po is that the LiFePo4 can not catch fire that easy. Those cells are the safest ones on the market, but they are more expensive than Li-Po packs. The packs costs 2 or 3 times more with the same capacity. They are also a little bit heavier than LiPo packs. As this is in a range about 10% or so this does not matter compared to the weight of my old SLAB batteries. So if you are not the nerdy guy you simple buy a LiFePo4 and you are good to go. I will link a very nice pack from Hobbyking (ZIPPY Flightmax 4200mAh 4S1P 30C LiFePo4 Pack). My decision was made rather fast that I will also go with 18650 cells. My 18650 cells came from harvested laptop batteries which I got from my local recycling facility. In a laptop battery, if one cell is dead the voltage drops and the laptop says "empty" - the pack will be put to trash usually then. So I took 15 old packs and disassembled them. 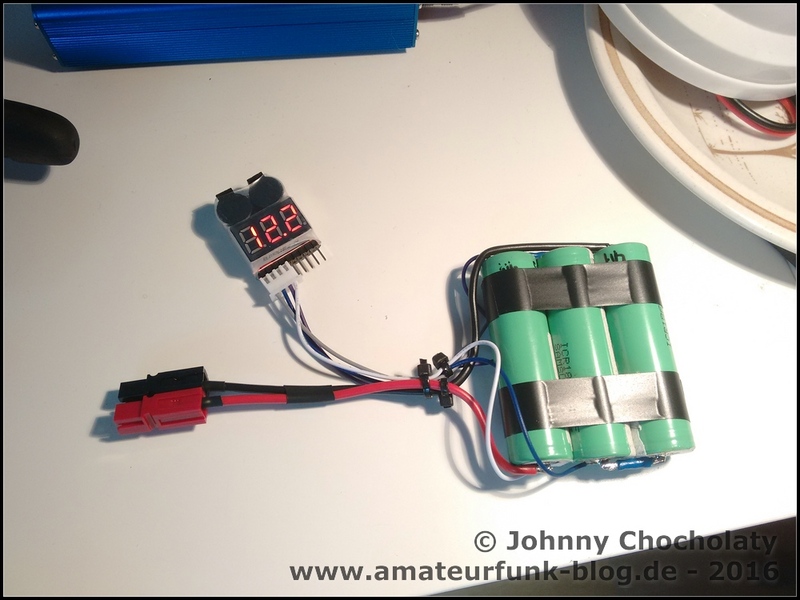 I bought an SKYRC iMax B6 LiPo NiMh NiCd 1s-6s Akku Multifunktion Ladegerät for about 35 bucks and checked the capacity of all 18650 cells individual after a charge. Only 7 cells from 100 were dead, the rest had good or bad capacity. All cells under 1000mAh went back to trash, all over 1500 mAh will be used here.. I have tested the capacity of all my single cells and put 3 together in series, all had about 1600mAh, so not the full 2200mAh, but hey it was almost free... Compared my 2.200mAh SLAB, this battery saves about 2/3 of the weight and delivers more current, as it has a way flatter discharging curve. I use 18650 holders to charge and to test the capacity of my cells. You need to solder the holder that it matches your needs. I use 4 cell holder (charging, 3 in parallel) and also 3 cell holder (11.1V nominal in series for my FT-817). For my FT-817 a 3S pack with 11.1V nominal is ideal, but t a 4S pack has 16,8V, way outside of the specs that the regular transceiver i.e. an Yaesu FT-857D (13,8V +/- 5%) can handle. When you don't use an FT-817, you might need a 4S-pack with a diode or a bridge rectifier in series to draw a bit of voltage. You loose some capacity then, you simple convert them in heat. Not a good thing in the field as I find. Of course you can use a step-up/step-down converter, which has a way higher efficiency factor but might causes noise on the HF-bands. Instead of using a 4S-pack for a FT-857D or similiar "big" TRX, I would rather go with a LiFePo4 (please check above) then. Do you need a Battery Management System Or BMS? No, there is no need for a BMS if (!) you have a balance charger and add a balancer lead. You see it on my photo. The balance lead comes from China, 10 for $2 or so. The BMS works a bit like a balance charger. You only need it if you charge with 12V. Most will allow 12-16V input or something. As you never know if those cheap chinese BMS really work, I charge balanced which gives maximum security. Here is a good video on the BMS thing: I use the "Monitoring" device, which is a simple Li-Po beeper which was under $5. Is shows the voltage of all cells. Not surprinsingly they don't drift too much, as I mix only cells together which have the same capacity. 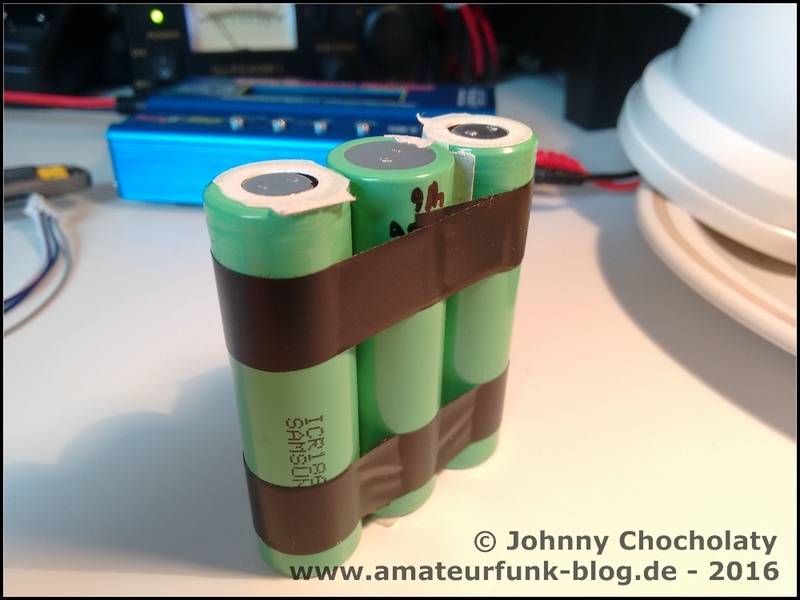 Is there no risk in using a 18650 battery pack? There is a risk, but the risk is not as high as when you use a RC model Li-Po pack. You minimize this risk almost to zero if you charge balanced and add a balancer lead. The other part is not to discharge the cells to a critical level. I use a cheap Li-Po beeper set to 3V per cell to reduce this risk. According to the fact sheet of my 18650s the Discharge Cut-off Voltage is 2.75V, so a lot of "security" in between. I use such cells since months and there was no drift so far, as I mix up cells with the same capacity, which I tested with my balance charger individual per cell. The risk is a lot lesser than using a model RC LiPo pack which is also unprotected and has a way higher failure rate. 18650s are around in quantity of billions, if you know what you do, the chance of blowing someting in ZERO. There is only a singe one Li-Po pack which I can recommend. It is the Windcamp WLB-817S Li-Po battery pack. It perfectly fits inside of the FT-817. The pack is protected (normal RC Li-Po packs are never protected as the RC models draws around 100 Ampre) and it is covered from the FT-817 so the chance for a mechanical demolition is rather low. A mechanical demolition of a so called Li-Po „pouch-cell“ often results in a fire or even in an explosion caused from an internal short inside the cells. The pack costs around 70 bucks, around 100 Euro if you buy it in Germany. That was too much for a simple battery pack. If you don't like my simple 11.1V 3S1P power source, you can also check out Julian's (UltraPack DIY 18650 48wh Battery Pack).This pack has a built-in BMS, so you don't need a balace charger and you can connect a solar-charge controller to the pack. As his pack uses a 4S1P config, you also need a diode or a bridge rectifier in series to draw a bit of voltage (same as describes already in the 18650 4S section) when you use it on you FT-817. As in his pack the cells are not hard-soldered together, he can put out a single cell out of the tray without a problem. He can also charge a single cell at a 4,2V source (harvesting from an old cell phone power bank for example) in emergency situations. His design is some kind of a muli-use EmmComm setup and of course you pay for this extra functionality if you need it. It's your choice. Please comment below as I can't answer all my E-Mails. Most of the people ask the same questions, so I will update this article from time to time.